If they can’t see you… they can’t eat you! 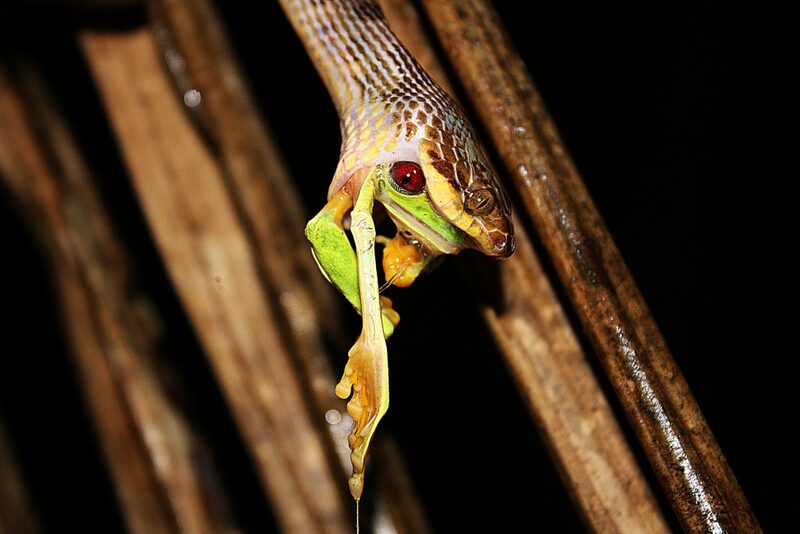 Snake captures an unsuspecting frog. Photo by Manuel Sánchez. It’s almost midday, and the forest is drowsy with the intense heat and humidity that you find during the rainy season in the Osa Peninsula, where the temperature can easily surpass 90 degrees. I direct all of my attention to the forest floor in search of the sweet and fleshy fruits of the Zapote tree. The spider monkeys that also eat from this tree are not disturbed by my presence here; only a few centimeters away from my foot one of the thousands of leaves that cover the forest floor flutter for a brief second, showing the silhouette of an amphibian that disappears again, scampering across the fallen leaves. 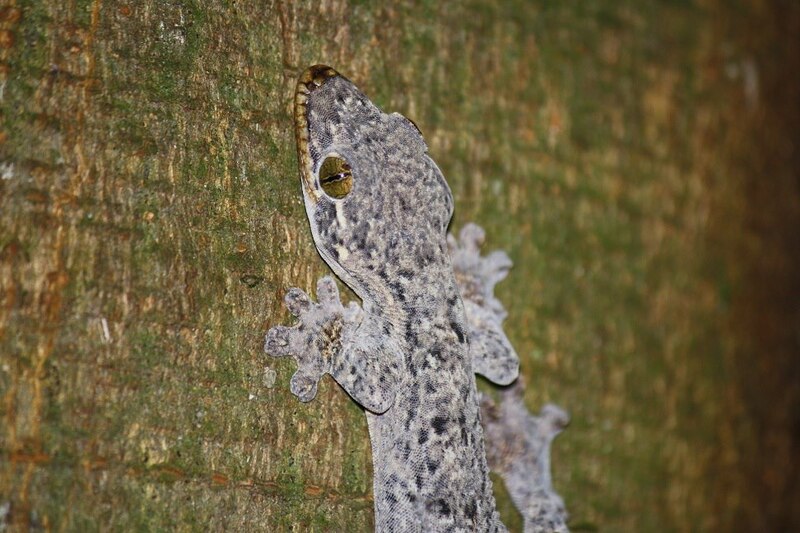 A Gecko attempts to conceal itself on the bark of a tree. Photo by Manuel Sánchez. The relationship of predator and prey is determined in great measure by the defenses upon which the prey rely and the predator’s ability to overcome them. Diverse defense mechanisms exist in the animal kingdom; chemical methods, for example, are amply used to repel predators through the production of foul-smelling odors or liquid irritants. Toxic substances or poisons are also popular defense mechanisms and can be obtained in one of two ways – indirectly through ingestion of plants or other animals, as is the case for many arthropods, or directly synthesized by the animal, as is the case for many snakes. Many physical defense systems also exist, such as the armadillo and its shell, or the porcupine and its sharp quills that are able to deter even the most capable of predators. This eternal evolutionary war between predator and prey has been brought to the level of an art in the tropical forest, where the ability to be invisible, or to appear to be something else, can mean the difference between life and death. This adaptative method of defense is what has filled the forest with “dry leaves,” “twigs,” and “dry flowers” that can fly, or jump, to disappear entirely as quickly as they appeared. It becomes pretty clear that these “leaves” and “twigs” aren’t really leaves and twigs at all, but insects and amphibians adept at disguising their presence. 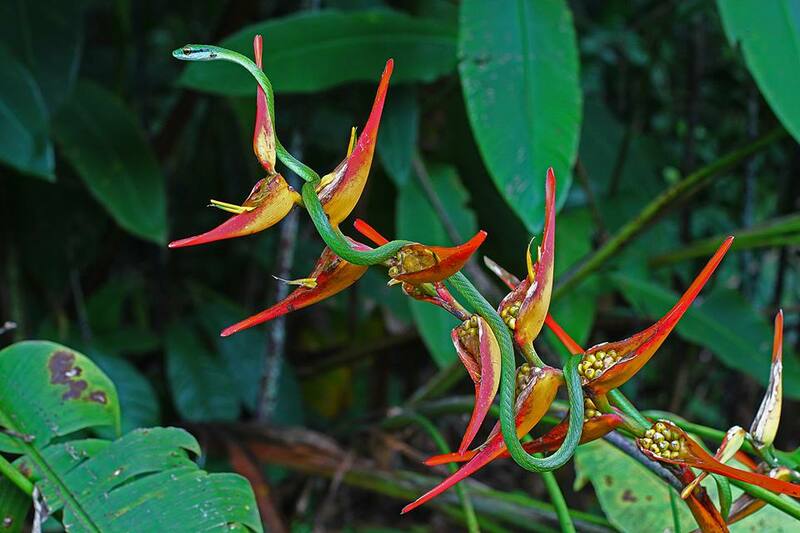 A green garden snake resembles the branch of an orchid. Photo by Manuel Sánchez. Myriads of insects, amphibians, reptiles and even birds use the method of mimicry to deceive the senses of other animals and to pass by undetected. Some act as snipers, lying immobile until the perfect moment to leap onto their unsuspecting prey, while others use a strategy of living their lives in anonymity, remaining practically invisible in the forest. Whatever the tactic employed, it is without a doubt fascinating that this force to cling to life, indelibly engraved in the animal instinct, is the engine that allows each day to change the world. This entry was posted in Miscellaneous, Science and Research. Bookmark the permalink.